To be honest, it's not as small neat as I would like it due to the three different power connections, but here she is. On the site it says it uses a 7660s for the charge pump, but the schematic shows a MAX1044, remember the two are interchangeable. Correct. I forgot to put that in the build notes. I'll fix that when I get home. You can tag it, nice Boost. I made it for Bass and its really transparent and stays pretty clean. It even boosts my active 6 String Bass without to much clipping. Great stuff, thanks for that. Can I ask what you did to change it for bass? Increase the input cap? you shouldn't need to do anything, it was designed for bass. Got this one working with a MAX1044, thought with the treble controls up high, there is a very high pitched tone that is constant. Still a very nice, usable boost that takes signal from other pedals with ease. I experimented with a 7660s and got a pretty nasty whine from it. i think i found the source of the whine. if you look at the 10uF cap that goes from pin 4 to ground, right next to the 3.3M is reversed. the negative should be on ground and the positive at pin 4. Thanks!! Flipping the polarity of the 10uF you described cleared up the whine on the MAXX1044. Sounds great(er)! I still have a nasty oscillation with 7660s, but then again, I might have a few bad 7660s'. Well glad the cap was the issue. I can't believe I had it reversed, probably happened when I was moving stuff around and didn't realize it was flipped. Also, really happy it sounds good, since there's no videos samples to hear I wasn't sure if this was a worthwhile build. So. I build it. It works. And it works very powerful. Thanks Zach! But I have that constant noise, that Brandon describes (and other too). Zach, did you manage to correct the layout or I must connect the 10uF cap reversed? I am now connecting the negative of the cap to Ground, but still have that noise. It goes off when I turn the Treble full ccw (at zero I think). But it comes again if I start to lower the volume of the bass guitar. The noise is present event before I connect the bass. I play on active bass if that matters. The same is with the lead guitar, though. I accidentally touched the board under the MAX1044, somewhere between 7 and 8 leg, and the noise gone. Where I go wrong? What to add to compensate my finger? Note sure what's going one, maybe a bad chip. The layout was fixed. Your finger is acting as ground. Form what I see in the schematic pin 7 & 6 are not connected. Maybe adding a ground to pin 7? And your English is fine. If you add the ground to pin 7 and the noise goes away let me know and I'll add it to the layout. I don't see any logic, but putting a jumper between legs 6 and 7 solved the problem (for me). No noise. Works perfect. Before that I test it with second chip and the noise was still there. 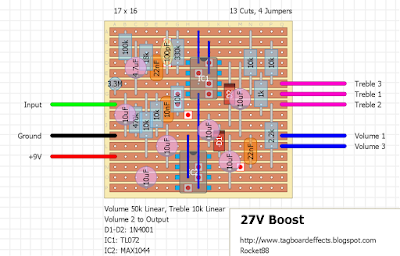 If you join pin 6 & 7 voltage doubling won't work. i don't think that will happen, i could be wrong though. in the schematic pins 6&7 aren't connected to anything, which they're not currently. according to the datasheet pin 6 is the low voltage output, and pin 7 is the oscillator control output. when you read the datasheet it shows in one of the schematics for voltage doubling a possible connection of pin 6 connected to ground (Fig.9). pin 7 should be left unconnected, but maybe connecting pin 6 to ground should be done for this build. 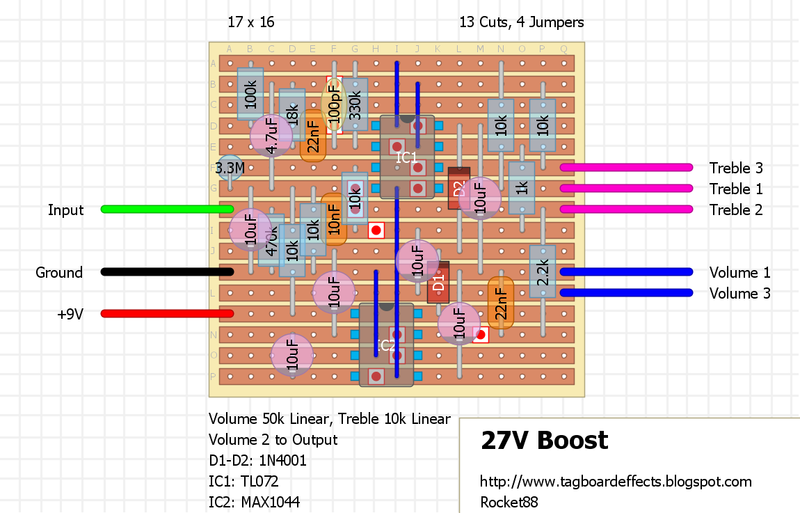 I have just finished 27 v boost. It works, but i have noise sound when i turn the treble pot. I'm trying to build this one. I have several 10uF 35v bipolar (non polarized) electrolitic caps lying around, can I use them as well? Hi, I am building my own preamp for a marshall combo which preamp is dead (luckily the power amp is alive). I tried with a ready made preamp delivering a nice amount of gain though I would like to get still a bit more power from it. Would you recommend to use this booster to send a bit more input to the preamp stage? Would it boost all the frequencies? Thanks in advance!!! Does the MAX1044 need to be an 's' model like the 7660 or will a mx1044CPA work without whine? just saw this tim. didn't know there's a max1044s. maybe using a 7660s instead will not have any wine. i'm only guessing, since i haven't built this effect, but know that 7660 will wine, 7660s will not, and max1044 is interchangeable with 7660s. hey rob. the diodes are correct. in the schematic the line side of the diodes points away from the the charge pump, which id does on the layout. re-read what you wrote rob, i missed that you were saying the cap was reversed, and you're spot on. made the correction. hopefully that was the cause of the whining for people in their builds. Tag it. This updated layout is verified. Built with an ICL7660SCPAZ and had an issue with whine, grounded pin 7 of the IC and the whine went away. The issue could also have been due to my inexperience. My first ever build and working great! If you jumper pin 6 & 7 of IC2 or ground pin 7 voltage is no longer doubled, for my test this measured only 7.9ish volts, but yes it is quiet and does work but without the voltage it is supposed to be. I built this with a MAX1044 from Tayda and get a very loud whine which gets worse when you turn up the treble, ear piercing! I use a very good power supply too. Hmm... Apart from that it does work well. If we could just eliminate the whine. When you touch IC2 it does use you as a ground it seems and the noise is reduced. I'd like to figure this one out. Maybe I try some other MAX1044's or get the 7660s.